You can find Part 1 of my Ireland adventure here. As we left the Burren and headed for Limerick, we had a relaxing drive through the Irish countryside with lots of photo stops. 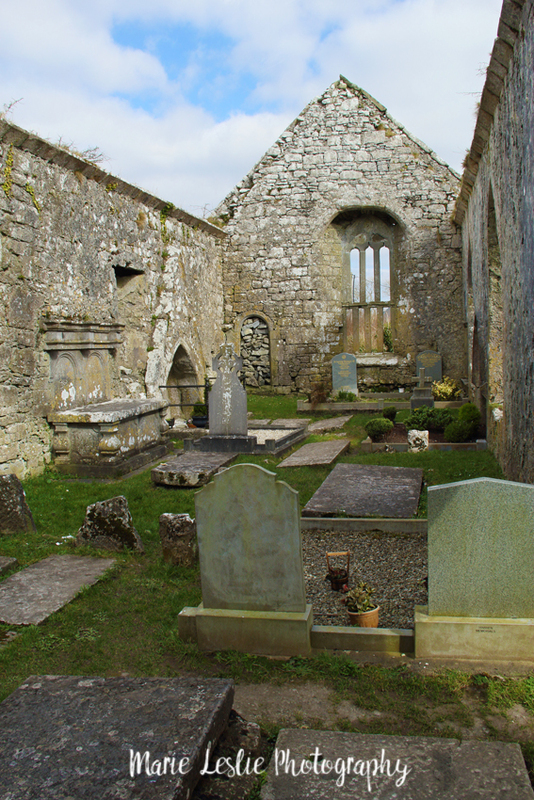 One standout was this ruined church turned cemetery in Killinaboy. 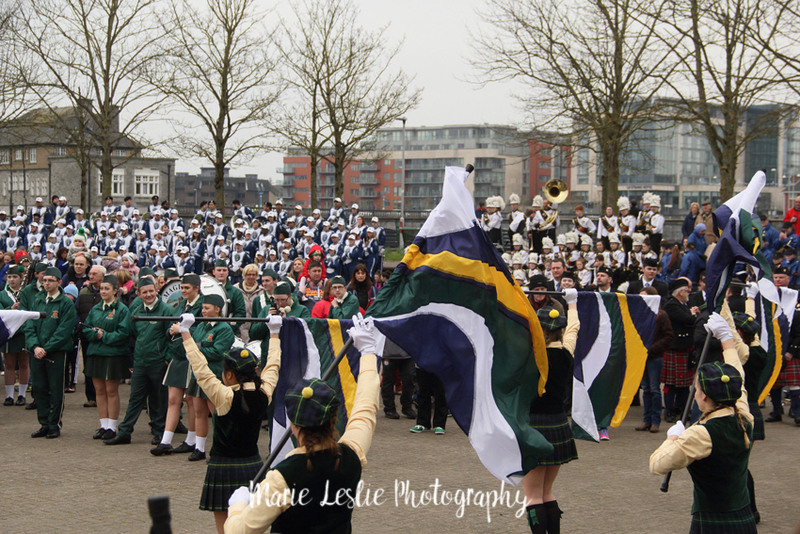 We spent the next days in Limerick for their St. Patrick’s Festival and our band’s second parade. Limerick was such a surprise to me, as I’d been told by more than one person it wasn’t a city worth visiting. On the contrary, I was captivated by its beauty and history and wished we had more days to spend exploring. We spent a good portion of the morning wandering the streets of Limerick, admiring the architecture, marveling at the history and photographing the doors. The doors of Ireland are wonderful. Unique and colorful–our American front doors are pretty boring by comparison. Here are the results of our wandering. This is absolutely my favorite photograph from Ireland (and it’s available in my Ireland gallery–by clicking on the photo). We also stumbled across the Frank McCourt Museum and my hubby, sport that he was, humored me with a visit to the childhood school of one of my favorite authors. You can find Frank McCourt’s books here—they are well worth the read (warning–they do contain strong language). 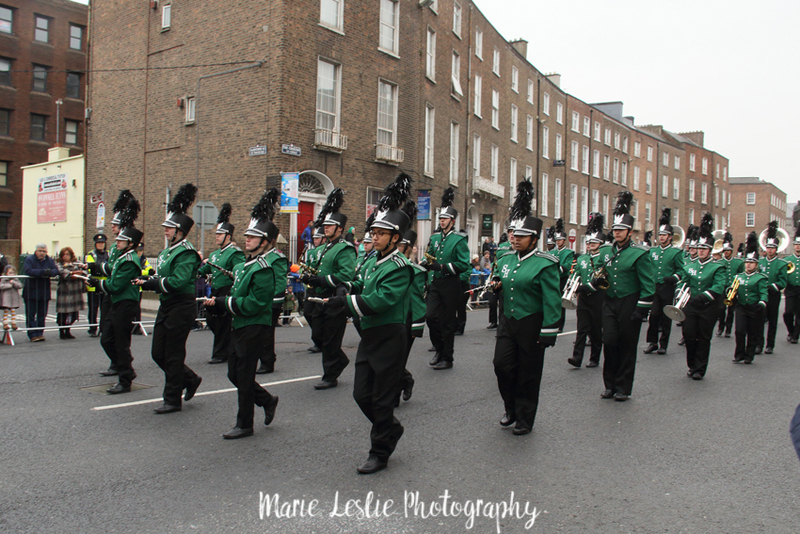 The Smoky Hill High School Marching Band performing in the Limerick, Ireland, band festival. Watching all the bands perform for one another in Georges Quay (pronounced key) after the Limerick Parade. Another highlight of Limerick, besides the parade and watching all the bands perform in George’s Quay, was discovering King John’s Castle and also visiting historic St. Mary’s Cathedral, still in daily use after nearly a millennium. I am awed by both the history and the workmanship of the many historic cathedrals and churches we saw in Ireland. To create such architecture and beauty without any of our modern tools or technology always leaves me amazed. St. Mary’s Cathedral in Limerick. It was built nearly 1000 years ago, and is still in daily use. The workmanship and beauty of this cathedral are awe-inspiring, especially when you realize it was built long before power tools and cranes. All built by hand, by loving craftsman to honor God. From Limerick, we parted company with our band and went on to our final stop in Cahir, where we were fortunate to stay at the Cahir House Hotel. The historic manor house turned hotel was another fun stop. We had a view of Cahir Castle from our room. The hotel is located on the town square, so we were able to easily walk all through the picturesque village. We had dinner in the hotel pub, where I had the most delicious seafood pie ever. Think Shepherd’s Pie with seafood in it. Yum. he main street of Cahir from the Castle tower. The hotel is the last building on the right. Along the way, I had to make a stop for more sheep. I really stopped because we finally came across a black sheep, but he wasn’t nearly as interested in me as I was in him. This one, on the other hand. The next morning we decided to visit the Castle before heading to the Tower of Cashel. Cahir Castle. Such a lovely experience. We were the only visitors on a misty Monday morning and had the castle to ourselves. Next up was our visit to the Tower of Cashel. When we arrived at the Tower, though, it was under restoration and covered in scaffolding (but still open). So we went for a walk around the outer walls while deciding whether it was worth the visit. Imagine my tremendous delight when we rounded the hill and found the breathtaking ruins of Hore Abbey in the valley below. What a wonderful way to end our visit. We spent our time wandering the ruined abbey and pondering on those who built this beautiful structure and then abandoned it to history. I guess we’ll try again for the Tower of Cashel on our next visit. Hore Abbey. Build sometime in the 1100s and abandoned a century of so later. Perhaps one of my favorite spots in Ireland (and my favorite photograph) . To make our departure easy and less stressful, we spent our last night in Bunratty at the Bunratty Courtyard. This might have been my favorite lodging of everywhere we stayed. The hosts were so welcoming, the room was spacious and comfortable, as was the rest of the house, and we ended our trip with a filling and delicious last Irish breakfast. We wish we had found this for our first night as well. Next trip, I suppose. Its close proximity to the village of Bunratty and the Bunratty branch of the Blarney Woolen Mills made my last-minute shopping easy as well. Bunratty is only about ten minutes from Shannon, and flying out of the Shannon airport back to the states is quick and easy. We were able to go through American customs in Shannon and the whole process took less time than it takes me to go through airport security in Denver. My daughter’s experience in Dublin was far less enjoyable and it made me glad we chose Shannon. I loved my Ireland adventure. The people were delightful and welcoming, the scenery was beautiful, and I felt like I had come home again. I am sure there will be return visits. After all, I still have a long list of places to visit—and that is only in one corner of the Emerald Isle.